Edward Hermann Haeusler, Wagner de Campos Sanz and Bruno Lopes, eds. This volume includes fifteen research papers to celebrate Luiz Carlos Pereira's 60th birthday. Among the authors contributing to the volume we find colleagues, friends - including his PhD advisor - and admirers. Similar to Luiz Carlos Pereira's intellectual interests and work, the contributions range from Philosophy to Mathematics, from Mathematics to Logic, and from Logic to Philosophy, passing through Computer Science. They are the result of current research by well-known scholars in these fields. Proof Theory is, maybe, the Ariadne's thread that unites the different subjects treated. 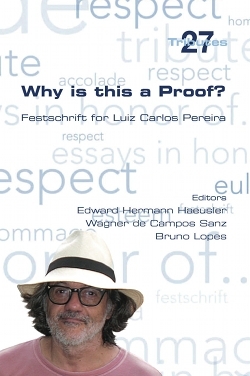 Questions around the nature of proofs are often present in Luiz Carlos' formal and informal talks and publications. Of course, he was not the first to dedicate himself to these questions, but he always raises and deals with them enthusiastically. This enthusiasm, together with his intellectual perspicacity, has allowed us to enjoy a wonderful journey into the world of proofs. Although not all contributions focus directly on proof theory, we can feel its echos in all of them.